After being stuck here yesterday lots of boats were trying to get underway as soon as possible. Two of the boats moored either side of me are off into the lock. I still ain't moving all that fast so let them through. The entrance to the Shardlow basins and I have caught up with the BW staff that are taking the narrowboat on which the incident happened. 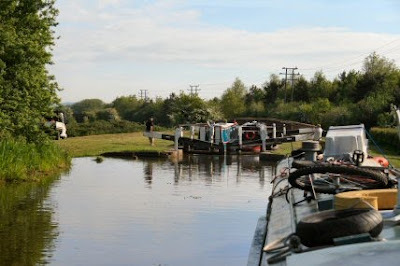 It is secured along side another boat so there is no need to turn it round. 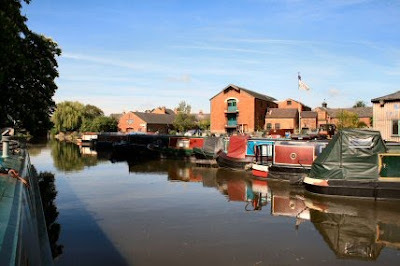 Wiki - Shardlow - The river is navigable as far as the sea at the Humber Estuary, as is the River Soar which joins it some two miles down. It had always been an important trading highway and, with the crossing of the turnpike had, by the 18th Century become a river port. In 1770, James Brindley brought the Trent and Mersey Canal through the village to join the River Trent at Great Wilne at the junction of the Derwent which was also, up to a point, navigable. 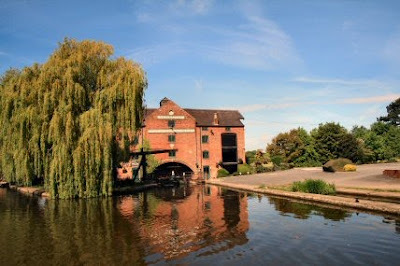 Shardlow thus grew rapidly as a trans-shipment point, not only for road vehicles, but between the broad river barges and Brindley's canal narrow boats. 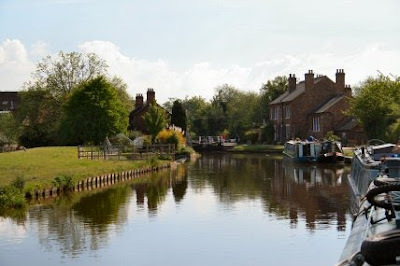 Two families made their fortunes, the Soresburys with rapid horse-drawn 'fly boats' on the Trent, and the Suttons with their barges and narrow boats. The population rose from three hundred to over a thousand but, in the 1840s the arrival of the railways signalled the beginning of the end. 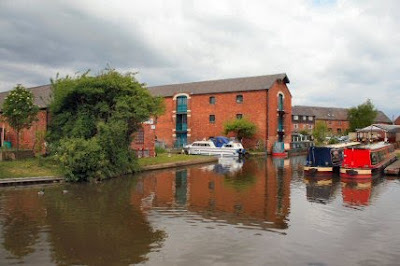 Most of the warehouses and other buildings were converted to other uses or as private dwellings. 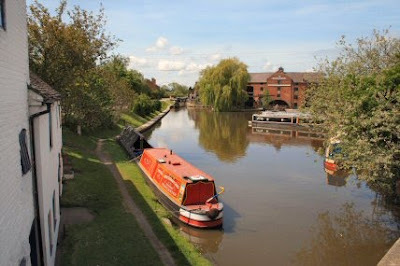 What is left has been preserved as the Shardlow Wharf Conservation Area, including a milepost inscribed "Preston Brook 92 miles." Shardlow and Great Wilne had been included in the parish of Aston-on-Trent until 1838, when Shardlow constructed its own church. also the legend that is Sara Shardow! I read that last bit and there is nothing on Wiki about it or a hit on Google. Anyone know anything about her. 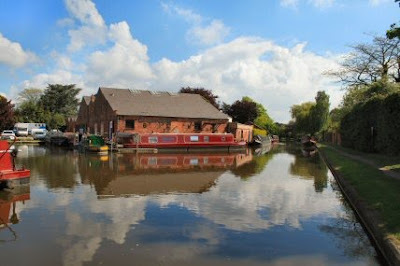 Shardlow is full of old buildings. Many have been converted to one use or another. 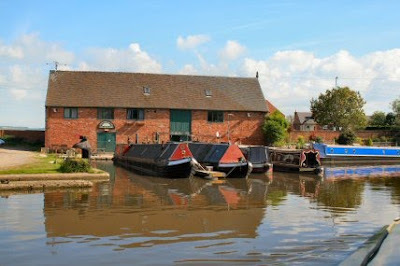 This one is the Shardlow Heritage Centre with exhibitions of canal history. The place is very photogenic. There is a large sign on the from of this wharf saying 'Navigation - the Trent to the Mersey'. This is the Trent Mill and now called The Clock Warehouse. I had a walk through the village. It didn't take long. The whole reason for its being here today is the canal. Other warehouses are converted to accommodation and a really good job has been made of it. There are several small arms that at one time would have been used for unloading but today are used as a mooring. The main area is still in use as a boat builder and repairs. There is everything you need here. Dobsons Boatyard and Miller Marine are worth a visit even if it is only to check out the second hand books they sell to support the air ambulance. One of the buildings still in use has a huge sign saying Stoves on it. I called in but the item I wanted would have to be ordered.